Do you know someone who has made a difference to our country? From local citizens to national and international personalities, all Canadians are eligible for the Order of Canada—our country’s highest honour for lifetime achievement. While the governor general, who is the Chancellor and Principal Companion of the Order, approves the final appointments, it all starts with citizens like you taking the time to nominate someone who deserves this special recognition. The Order of Canada was created in Canada’s centennial year, 1967. Since then, many deserving Canadians including artists, scientists, doctors, educators, entrepreneurs, community workers and many others, have been appointed to the Order of Canada. Their contributions are varied, but they all have enriched the lives of others. 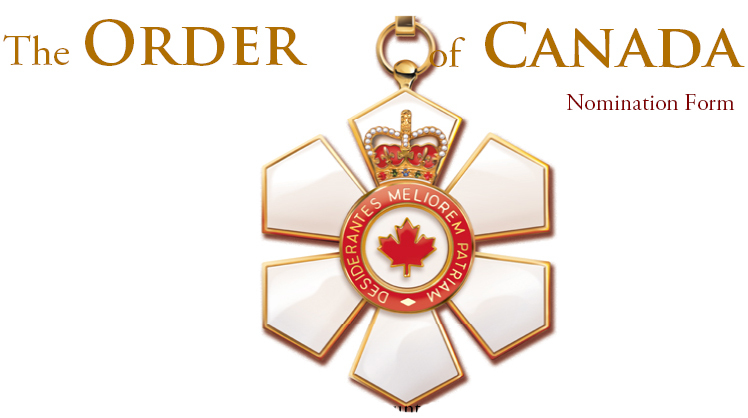 The Order of Canada’s motto is DESIDERANTES MELIOREM PATRIAM (“They desire a better country”)—words its members bring to life. If you know someone who might fit this description, nominate him or her by completing this form and sending it to the Chancellery of Honours, the branch of the governor general’s office responsible for administering Canadian honours. (Please note that serving federal and provincial politicians and judges are not eligible, and no posthumous appointments are made.) An independent Advisory Council evaluates nominations and recommends candidates to the governor general. The number of appointments each year is limited, and not everyone nominated is selected. To avoid disappointment and to respect the privacy of the people consulted, the Chancellery keeps nominations confidential, and we ask that the nominators and others involved do the same. Thank you for your interest in the Order of Canada. professional activities/occupations with responsibilities and time frames; date(s) of active participation in organizations; all official honours/awards; and any other related information that might assist the Advisory Council in making a decision. persons who are familiar with the candidate's achievements.